With the exception of two small portions, Nottinghamshire lies wholly within the basin of the Trent. 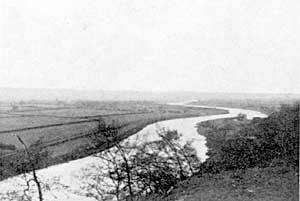 The basin of the Rother touches it north of Sutton-in-Ashfield, and the basin of the Witham just east of Newark. The Trent is 147 miles long, and is second in length only to the Severn amongst English rivers. When it enters the county it has already received the drainage from two-thirds of its basin, which has an area of 4052 square miles. It is then a fine river with clear water and a rapid current. Its general course through the county is shaped like a bow with its convexity towards the east. Throughout it lies in a narrow vale about two miles wide. For the first third of its course the vale is trench-like and clearly defined by hills on either side. On the west these rise to over 300 feet; but they gradually decline until at last the vale proper is almost indistinguishable from the low country through which it passes for the remainder of its course. The windings or meanders of the river are of two types. The larger ones sweep from one side of the vale to the other and are sometimes three miles from bend to bend. These are probably inherited from the times when the Trent was a fuller stream than it is now. Superposed on these are smaller meanders which are usually less than one mile wide. These belong to the Trent as we now know it. 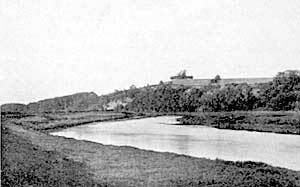 Malkin Hill and the Trent below Radcliffe. Though the river swings from one side of the vale to the other it “hangs” to the right. This is shown by the fact that it is only on this side that the river impinges against the base of the hills which bound its vale, as shown in the illustration above. Here it has undercut them, and their usually gentle slopes are replaced by precipitous cliffs. At these places the river is seen in the act of widening its vale. It is therefore interesting to note that those villages whose names (e.g. Radcliffe) are based upon cliff as the predominant natural feature of the neighbourhood are all confined to the right side of the vale. The height above sea level of the vale at its entry into the county is only 90 feet; where it leaves it it is about 15 feet. The land level is usually only a few feet above the river-water level. When, therefore, the rainfall is heavy the river is unable to carry off immediately the excess of water, and the surrounding country becomes flooded. In former years these floods were often very serious. The greatest of which we have record occurred in 1875. They are more frequent in the lower than the upper reaches, because there the river flows more slowly and is also subject to tidal influence. View of the Vale of Trent from Malkin Hill.